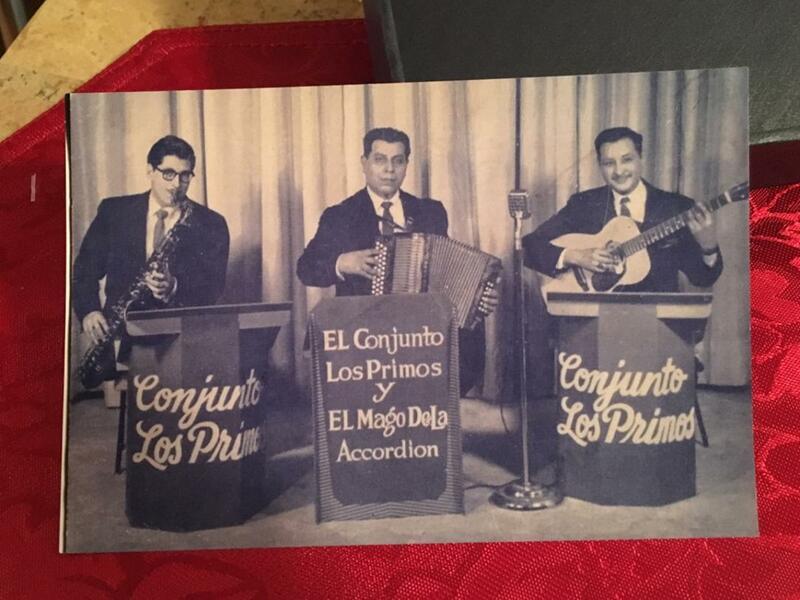 Willy Huron on saxophone, Casimiro Zamora on accordion and Martin Solis on bajo sexto. Dave Guerrero, Edwin Miller, Willy Huron and Martin Solis (right). Photo taken in the late 1970s of Martin Solis with his bajo sexto. State Rep. Cara Clemente issued a tribute from the state of Michigan. The News Hearld, a bi-weekly newspaper serving the Downriver suburbs of Detroit picked up the story. 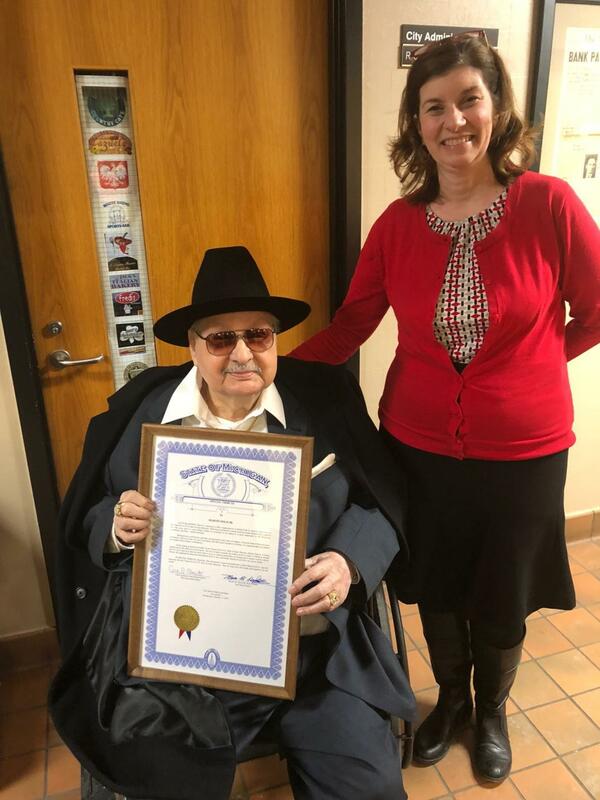 The city of Melvindale proclaimed Wednesday, January 17 “Martin Huron Solis Jr. Day" for his accomplishments. 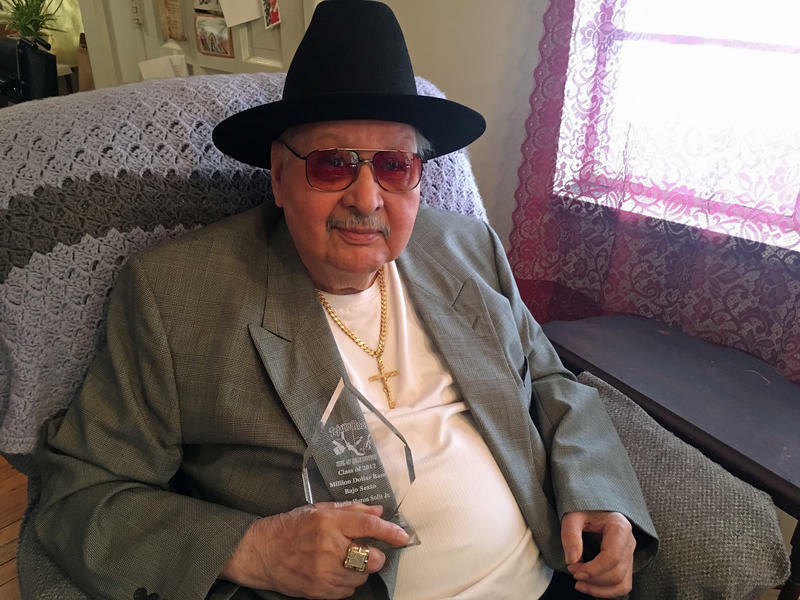 Martin Huron Solis Jr. is the first Michigan resident to be inducted into the Tejano ROOTS Hall of Fame Museum in Alice, Texas. 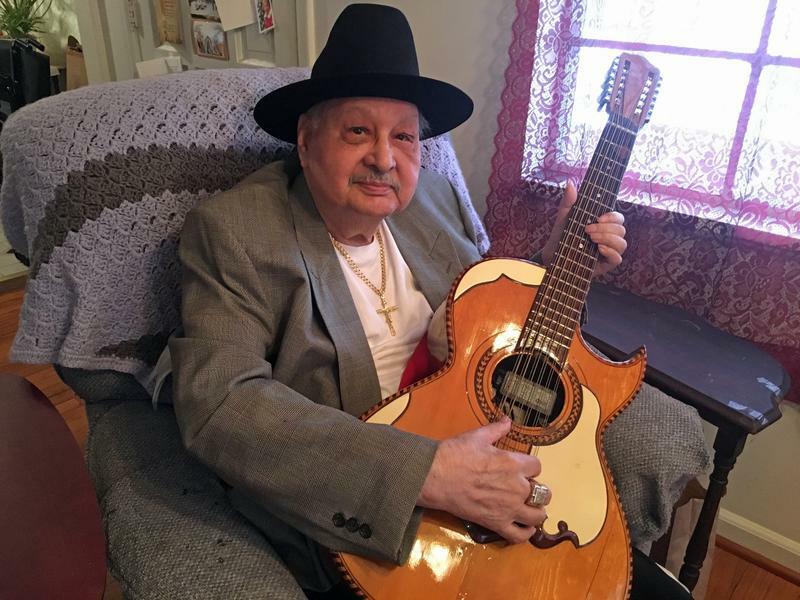 Solis was born in San Antonio in 1929 and began playing the guitar at age six. "Well we were migrant workers. And we didn’t have a job. My dad he decided we should come to Michigan. And that’s why I got here. That must have been 1948 or something like that. I remember the trip and it was nine of us at the time. Total, my mother had 12 children. We arrived at Coleman, Michigan near Bay City," he said. Tejano music became popular in the 19th century. Think waltz and polka brought over to south Texas by German, Polish and Czech immigrants, to traditional Mexican and American folk. At the heart of Tejano music are the accordion, vocals and bajo sexto, a wide-neck 12-string guitar used to create tenor and bass rhythm. Solis is a bajo sexto player and singer. He says, "It’s an instrument that’s kind of hard to play because of the strength you’ve got to put behind the strings." 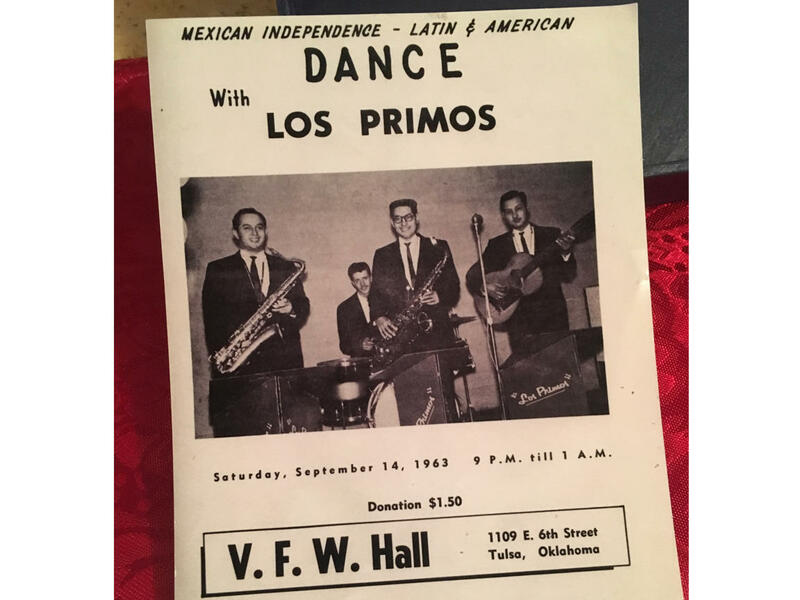 Solis, along with his friends Manuel Rivera, Rodolfo Martinez, Joe Martinez, and cousin William Huron, brought the Conjunto Tex-Mex music style to the Detroit area in the mid-1950s through the year 2000. Unfortunately, the Solis family doesn’t have many recordings saved of their father and his band Los Primos. But Solis remembers the those first years playing in San Antonio as a child. "They use to have political things going on in San Antonio. And I worked with a man, he used to take me with him, Mr. Johnson. We played for tips and he played for beer. So I just knew a couple of chords on the guitar. And he played the violin. I just followed him. At the time we played all kinds of music. He played Mexican music on the violin and he played hillbilly music. That’s how we got along." Solis also reminisces about his friendship with the famous accordionist and singer Flaco Jimenez. "Everybody in San Antonio Texas knows Flaco Jimenez and so do I. In the bar we were sitting and go into a conversation about age. 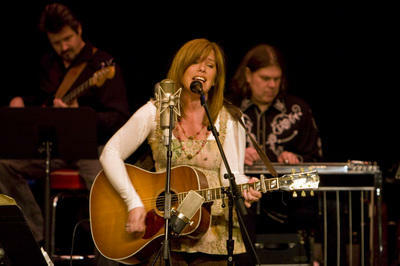 He told me never to stop singing because I had a god-given talent. But I never looked to recording. 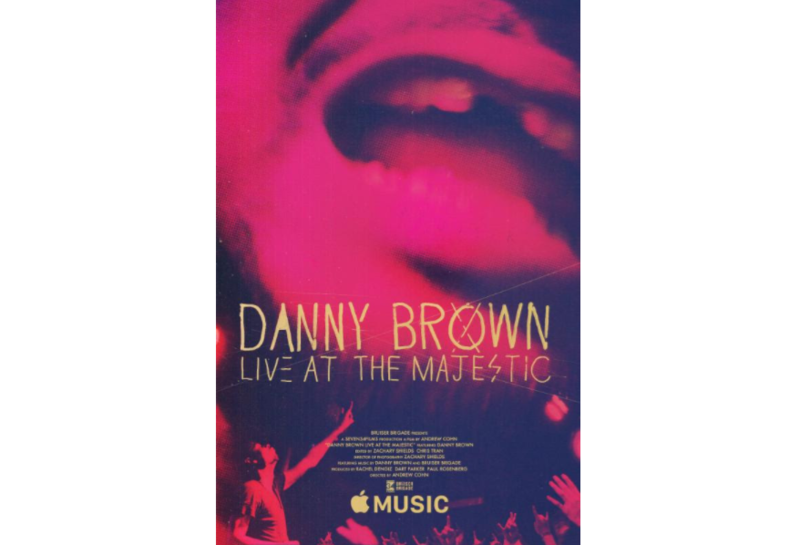 I just liked to sing." Solis served in the army and was honorably discharged in 1953. He married Anna Ramirez and is the father of three children: Martin, Pete, and Frank. For his accomplishment the City of Melvindale has proclaimed Wednesday, January 17 “Martin Huron Solis Jr. Day." State Rep. Cara Clemente issued a tribute from the state of Michigan to him as well. "I think it’s a big thing that’s happened to me in my life, but it’s just not soaked in. It’s like a dream," he said. Stateside's conversation with immigration attorney Brad Maze of Palmer Rey PLLC, his former client Norma, and her eldest daughter Kenya. In 2001, the U.S. government granted Temporary Protected Status (TPS) to more than 200,000 migrants from El Salvador after a pair of earthquakes struck their country.